Les Paul Plus Top Pro/FX, LP-Shaped Guitar from Epiphone in the Les Paul series. The PRO/FX features a solid Mahogany back with a flamed Maple top and a solid Mahogany neck that's hand-fitted and glued into the body. The neck features a SlimTaper D profile designed to be both comfortable and fast. Epiphone has added an original Floyd Rose Special double-locking tremolo designed to allow the guitarist to raise and lower pitch for classic '80s style effects. The body is routed out in back of the tremolo to allow for pitch raising up to 2-1/2 steps while the downward range is wide enough to get the strings slack, the company says. It's combined with a R4 locking nut for improved tuning stability. Also added are Epiphone's new 4-wire humbucking pickups. In the neck position is the Alnico Classic humbucker. In the bridge position is the Alnico Classic Plus humbucker. It is over-wound for higher output without sacrificing its tone. Both feature Alnico-II magnets, enamel wire and are double vacuum waxed as well as 4-wire output. This allows for coil-tapping and this LP takes advantage of it with push/pull potentiometers on both volume controls. Other standard features include nickel hardware, premium Grover machine heads, LockTone tune-o-matic/stopbar and Epiphone's own StrapLocks. And like every Epiphone, it features their Limited Lifetime warranty. 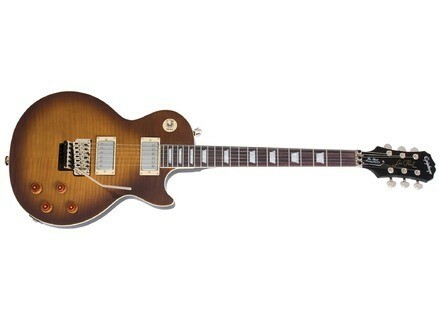 The US MSRP for the new Les Paul PlusTop PRO/FX is $1165 with an optional hard case for $132. It will be in retail stores starting in May 2010. See it up-close at the Frankfurt Musik Messe at the Epiphone booth #4.1 E50. [Musikmesse] Gibson Slash Appetite For Destruction Gibson USA introduced the Slash Appetite Les Paul, a guitar equipped with features associated with a Gibson Les Paul, and the added punch of Seymour Duncan Signature Series Alnico II Pro Slash humbucking pickups. [Musikmesse] Gibson Joan Jett Blackheart Melody Maker Gibson has announced the launch of the Joan Jett Blackheart Melody Maker. [Musikmesse] Epiphone DR-500MCE The DR-500MCE model features a rounded (Venetian) cutaway for upper fret access.